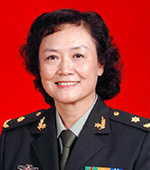 Dr. Li graduated from China’s Third Military Medical University in 1973 and obtained her Master’s degree in cardiovascular medicine in 1982. She was a visiting scholar at Baylor College of Medicine from 1990 to 1991. She has 40 years of experience in cardiovascular clinical care. Dr. Li has published more than 210 papers, edited 12 books and served as Chief Translator for four books. Dr. Li holds one patent and has received numerous central, provincial and ministerial-level recognitions in China for her scientific and clinical contributions. Dr. Li currently serves as President of the Chinese Society of Geriatrics of the Chinese Medical Association, Chair of the Committee for Cardiovascular Diseases of the Chinese Association of Geriatric Research, Chair of the Family Health Education Committee of China Medical Women’s Association. She is a doctoral supervisor at Nankai University and an adjunct professor at Tsinghua University School of Medicine. She is Associate Editor of three journals including the Chinese Journal of Geriatrics and an editorial board member of 12 other journals including the Chinese Journal of Cardiology. Dr. Li has guided 11 Master’s trainees, 25 doctoral trainees, seven post-doctoral trainees and 24 visiting Master’s trainees.